At first look, you may be convinced that this cat has escaped from the ocelot exhibit at the zoo. Despite indications of its name, the Ocicat is actually not a descendent of an ocelot, a margay, or a leopard. This spotted cat is 100% domestic. It was not bred from wildcats but rather, after the original surprise of the coat of the first Ocicat kitten, it was bred with the purpose of looking like a wild cat. It certainly lives up to expectations. The Ocicat was the first purely domestic feline bread to actually resemble a wild cat. Ocicats were developed by accident in 1964, the product of a Siamese and an Abyssinian cat. The intent was to produce an Abycat Siamese. 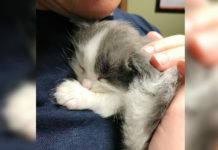 It was unknown what the litter would look like, and the breeder was incredibly surprised to find an ivory, spotted kitten among the litter. The breeder named the cat “Ocicat” due to its similarity to the ocelot, an endangered species that lives between southern Texas and Argentina. Photo courtesy of Robert under license. 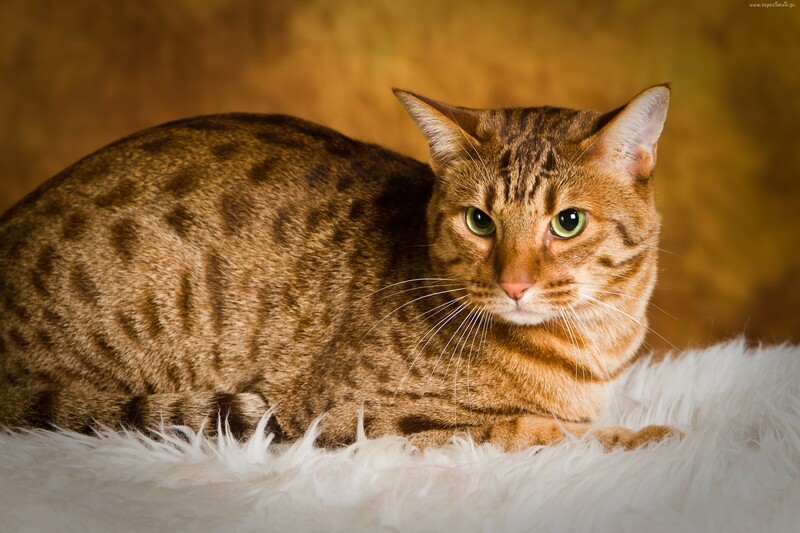 Interestingly, the first Ocicat, named Tonga, was neutered and sold as a pet in Detroit. However, a geneticist expressed interest in the possibility of breeding domestic cats that had similar temperaments to their wildcat ancestors. So, the Ocicat breeding started once again, this time also with an American Shorthair. The Shorthair gave the Ocicat the silver sheen that many cats have in their coat. It took 20 years for the Ocicat to achieve the high-ranking distinction it has now. 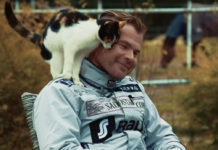 In 1987 it was granted Championship Status and which means they can participate in competitions and shows. Since its creation, the Ocicat has become the only spotted domestic breed selectively bred for its resemblance to cats of the wild. The American Shorthair version was bred following the original breed, and this variation of Ocicat is larger, easier to groom, and has a more muscular body. Though they appear small and sleek, you’ll be surprised by how much they weigh due to their strong muscles. The muscles on this small feline add to the impression that this cat belongs in the wild, even though it’s temperament is anything but untamable. What is the Personality of an Ocicat? The Ocicat has many traits that pet lovers would usually associate with dogs, or parents would associate with a two-year-old toddler. These cats break the expectations that cats are distant, independent creatures. Instead, the Ocicat acts as if it is seeing the world for the first time nearly every day. These cats have endless energy and curiosity, which you can see in their larger, muscular frame. The curiosity that prompts them to follow you around the house, trotting from room to room after your heels, is the same curiosity that could result in a wire being chewed through or a cup of tea falling from the table. So make sure that you pay attention to your Ocicat and have plenty of toys for playtime. Ocicats aren’t well suited to long periods by themselves. They can play for hours and hours. Many of them are avid hunters and height lovers, scaling whatever they can in your household. 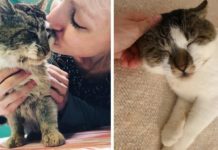 This feline is confident and independent, but absolutely adores spending time with its owners. These cats are great with families and small children. They have endless energy and love to socialize, almost as if they are extroverted kitties of the wild. Some owners have even report that their Ocicat follows them around the house. This breed has an expected lifespan of 15-18 years. What Do I Need to Know to Train an Ocicat? The zest that the Ocicat has for life is one of its most appealing qualities, but it is important for these felines to learn their boundaries. Once you teach your Ocicat the rules of the house, this intelligent feline will respect the rules. They are fairly easy to train, but their energy and enthusiasm take dedication. 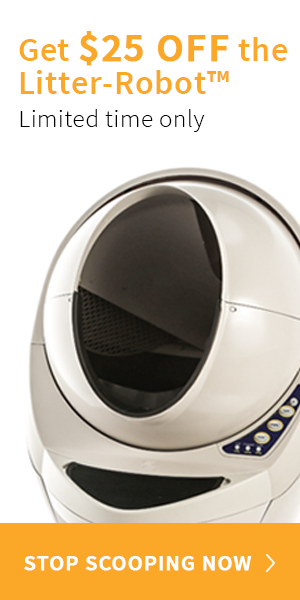 They respond to their names, as well as commonly used words and commands. It is also important to note the intelligence of this breed. The Ocicat is brilliant. You can train it to walk on a leash or play fetch like a dog. It loves to be around its owners, and will often observe you in action. Whether you’re preparing dinner or doing morning stretches. These cats also love to climb, as mentioned before, and can often be find scaling to the highest points in your home to watch what is happening below. 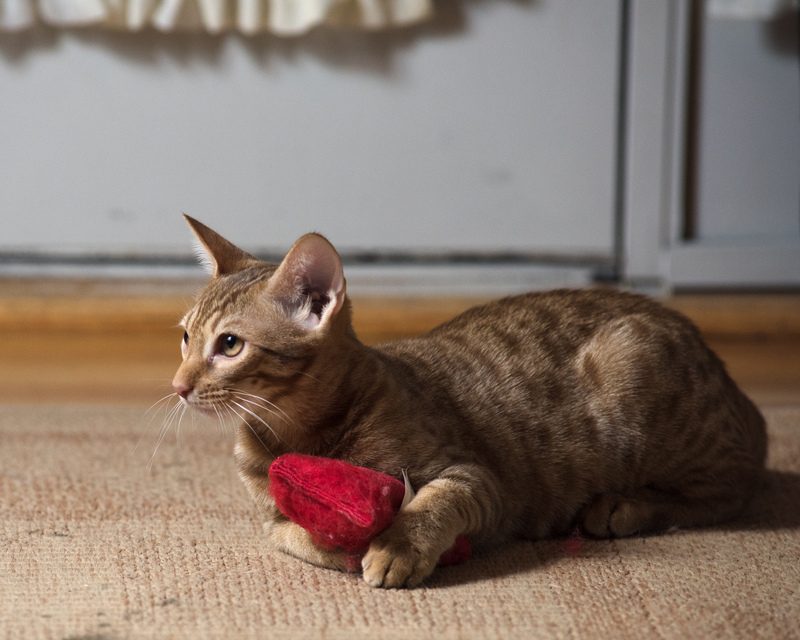 The Ocicat can be a bit possessive when it comes to its toys, and you should bear this in mind if the cat tries to hide toys from you or from other pets. The Ocicat does tend to get along with other animals, even cat-friendly dogs, although it wants to be the boss when playing with others. How Healthy is the Ocicat? Unlike some other exotic cats, the Oci does not require a special diet, although this breed is known to have occasional teeth and gum problems, like gingivitis. One way to avoid these problems is by brushing its teeth frequently to avoid gum disease or periodontal disease. This breed also can fall victim to liver or renal amyloidosis, pyruvate kinase deficiency and hypertrophic cardiomyopathy. These diseases are passed down from the parent breeds and can be researched more in depth for details. Ultimately, it is vitally important to have a candid conversation with the breeder about the possibilities of disease. How do I Groom an Ocicat? Grooming is also quite simple for an Ocicat, as it does not require excessive grooming or care. Their muscular bodies and short fur make them easy to manage. Go over their coat once a week with a rubber curry brush to remove dead skin cells. Male cats tend to weigh 10-15 lbs., while female cats weigh 7-12 lbs. You’ll rarely have the bathe this independent, self-caring breed. If you do choose to bathe your cat, choose a shampoo that will bring out the magnificent colors on its coat. The Ocicat is known for its distinctive spotted coat, covered in thumbprint size spots. Their coat comes in the colors tawny, chocolate, cinnamon, blue, lavender, fawn, and six shades of silver. Technically, these cats are categorized into four shades: ticked, spotted, classic tabby, and pointed. The spotted, wild coat of this cat is the dream of many a cat lover who always wanted to have a wild cat with the personality of a companion. What Does an Ocicat Cost? This breed typically sells for $400-$600. AOV (any other variety) of Ocicat other than the Spotted Ocicat will sell for roughly $100 less. Some older cats and those that are spayed or neutered cost less. This breed is not common, and it’s unlikely that you’ll find it in rescues or shelters. However, it isn’tt a terribly expensive cat compared to other exotic breeds.